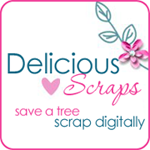 Delicious Scraps: Creative Team Call!! I never really write much in my blog lol Well it's been three months since I've started this blogger/digiscrap journey and would like to share some things with you all. First and formost all THANK YOUs count!!! Please leave some love if you download or just like anything on anyones blog! Secondly, if you are making CU freebies from other people's work please ask them if you are not sure what they mean in their TOU. I've asked people to take down stuff and I do not like doing that. I think my terms are clear and if not email me and ask. Most of the time I will say yes even if it is against my TOU but since you asked I will make an exception. I would like to continue making freebies for all the designers to use out there even though I've started selling my items. Third-ly =) If you have made something with my items give me a shout and I will proudly display it here and direct traffic to your blog or site =) plus I love to see what you have created!! To all tut writers - if you want to share some of my items in supplies email me for details otherwise it is not allowed - just link to my blog insted not download itself. Finally I am having a Creative Team call - all are welcome to apply. Email me at DeliciousScraps@gmail.com for details if interested. There's one of those questionnaires on my blog if you want to take part. I think you've already done one before so don't worry if you don't want to do it lol.